Have you heard? Gatemaster has partnered with CardConnect to bring seamlessly integrated payment processing to the software you know and love. This new offering will streamline the way you accept and manage payments, allowing you to spend less time reconciling transactions and more time growing your business. With additional features like next day funding and recurring billing, this is an offer you won’t want to miss out on. Visit us at Booth 1042! Tiffany Blair, Chief Operations Office of Gatemaster, sits with Melea, one of our all-star employees to discuss our GateOP$ program. Together, they talk about why it's important to get your guests excited about visiting your venue from the minute they arrive on the property. They also share a real-world example of how we helped a client increase their revenue by $1 MILLION in their first year with Gatemaster! Gatemaster has a very strong partnership with SKIDATA, the world market leader in access and revenue management. 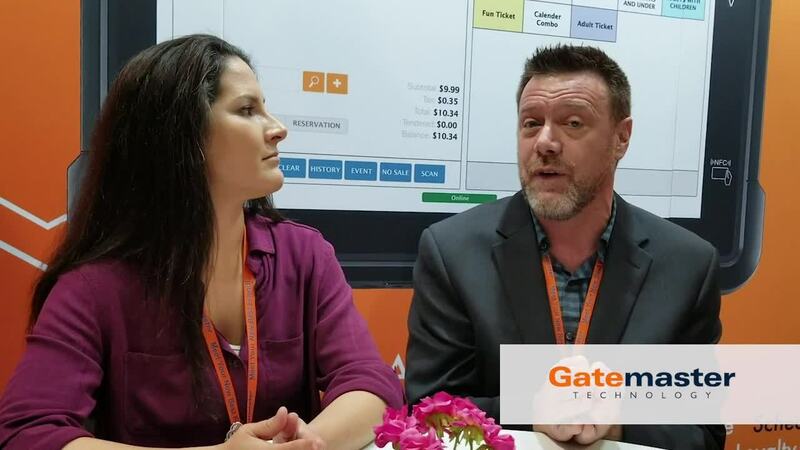 Tiffany Blair, Chief Operations Officer of Gatemaster, chats with Renier Steyn, SKIDATA's head of Sales in North America, to talk about the value and support that Gatemaster's ticketing software has provided to enhance their customers' experience. GreenGate is an exclusive point-of-sale integrated mini-golf app. This is the first scorecard app to offer point-of-sale accountability. Tiffany Blair, Chief Operations Officer of Gatemaster, chats with Katie Bruno from WDD about how partnering with Gatemaster has enhanced not only the GreenGate app but also WDD's initiatives around water parks, amusement parks, and other family entertainment venues. Gatemaster's own Tiffany Blair, Chief Operations Office, and Scott Stokely, Account Executive, check in from our IAAPA booth last month. Tiffany and Scott walk through the many markets Gatemaster works with, trends they're seeing in the industry, and how Gatemaster offers wall-to-wall solutions that no other service can match. As attraction operators, we all strive to offer the best possible guest experience. We know that our guests want the best experience possible and we know that they are willing to pay more to get it. When we create products and packages that are packed with meaningful enhancements, market them properly, and train our staff to position them to the right audience, we are contributing to an improved guest experience. Here are 4 strategies to drive revenue by enhancing your product lineup. Add Gatemaster to Your IAAPA 2018 Expo Plans! Add Gatemaster to your IAAPA expo plans. It’s easy for registered attendees, just click the widget below. IAAPA will be held November 13th - 16th, 2018 at the Orange County Convention Center (OCCC). Visit us at booth 3333. If you would like to attend and need tickets, please contact Brandi Blair at bblair@gatemaster.com or 510-799-9725 ext. 4422. You don’t need to monitor market trends to know that mobile devices are the public’s primary gateway to the Internet. You can’t use a desktop or laptop while waiting in line for coffee, while pushing a stroller, or while running on a treadmill. Despite this easily observable reality, many amusement and attraction owners still view the mobile version of their site as secondary. Join Us at the 2018 WWA Show in Vegas! Visit us at booth 1409 for the WWA Show, October 24th – 25th! Come say "Hi" and let us show you how Gatemaster can improve both your guest's experience and your bottom line.